Carbon materials, such as fullerenes, carbon nanotubes, nanodiamonds, graphene, graphite, and amorphous carbon, have been playing a significant role in the development of alternative clean and sustainable energy sources due to their unique and technically important properties. Nowadays, Carbon materials have been studied for the application to various devices such as lithium ion batteries, solar cells, electrochemical catalyst and so on. 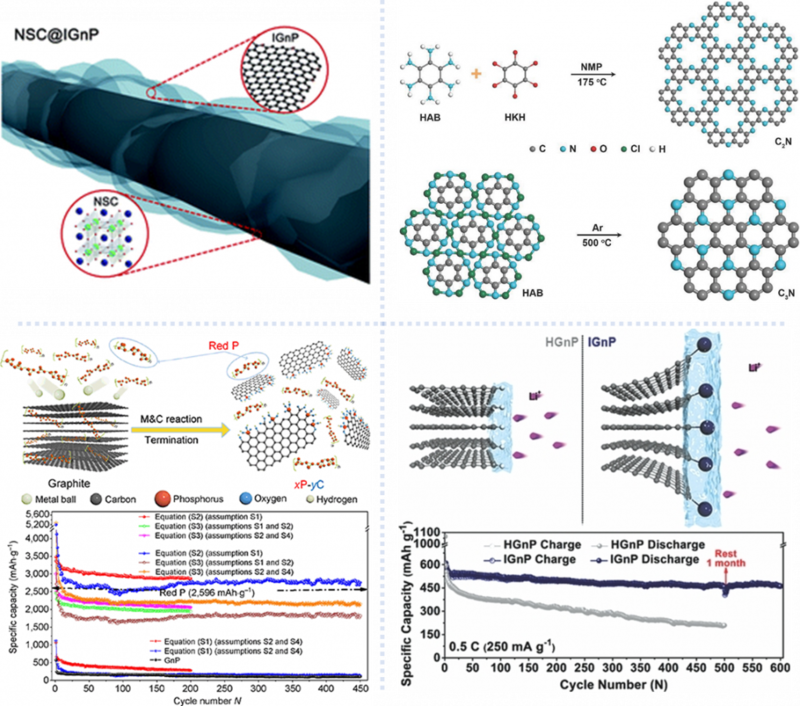 Our research group carry out ongoing study for the carbon-based materials such as edge functionalized graphene nanoplatelets (EFGnP), porous organic materials, metal-organic hybrid materials and so on. J. Xu, J. Mahmood, Y. Dou, S. Dou, F. Li, L. Dai, J.‐B. Baek, Adv. Mater. 2017, 29, 1702007. Xu, J. , Jeon, I. , Seo, J. , Dou, S. , Dai, L. and Baek, J. (2014), Edge‐Selectively Halogenated Graphene Nanoplatelets (XGnPs, X = Cl, Br, or I) Prepared by Ball‐Milling and Used as Anode Materials for Lithium‐Ion Batteries. Adv. Mater., 26: 7317-7323. Carbon based materials have been considered as promising candidates to realize commercially available energy devices such as fuel cells, solar cells, water electrolyzer, and so on. With structure controlled porous organic frameworks, we are searching for best electrocatalysts in various energy devices. The research deal with development of catalysts, analysis of electrochemical behavior, and operational mechanisms. 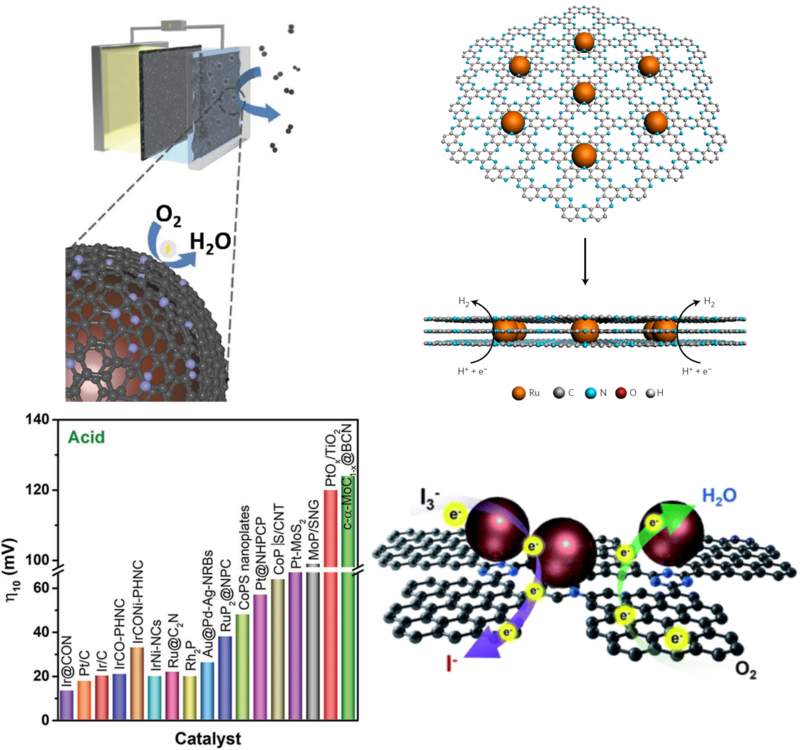 Among the various electrochemical catalysts, we are focusing on oxygen reduction reaction (ORR) catalyst for fuel cells and metal-air batteries, hydrogen evolution reaction (HER) catalyst for eco-friendly producing hydrogen fuel from water, and counter electrode in the dye sensitized solar cells (DSSCs).